The angle sum and difference identities facilitate determining the exact value of an angle, written as a sum or difference using familiar values of sine, cosine and tangent like 30°, 45°, 60° and 90° and their multiples. 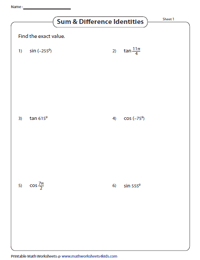 Navigate through exercises like find the exact values of trig expressions, evaluate and prove trigonometric equations using the sum formula and difference formula and a combination of the two. 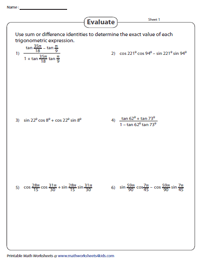 Equip yourself with a knowledge of the identity from the angle sum identity chart. Determine the exact value by observing the angle in the trig expression and split it as a sum of two known angles. Introduce the angle difference identity with the difference identity chart. Break down the angle as a difference of two known angles in terms of sin, cos and tan to find the exact values of the trig expressions. Recapitulate the angle sum and difference formulas, employing these trig expressions with angle measures that can be split as a sum or difference of two known angles using the compound angle formulas. This array consists of trigonometric expressions to be simplified and expressed as a single trig function using the sum or difference identity. Reduce the trig expressions to known angles of sin, cos and tan. Featured in this ensemble are trig expressions that have to be evaluated; compute the exact value using the compound angle identities in combination with the other trigonometric identities. 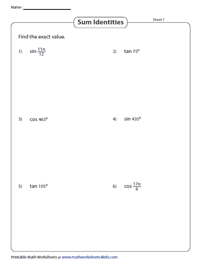 Explore the trigonometric ratio worksheets, incorporating trig expressions, find their values based on the given quadrant or interval within which the angle is located; implementing the compound angle identities. 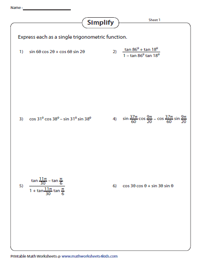 Apply trig identities in verifying trigonometric equations. Choose a side (L.H.S or R.H.S) to begin with and work on it until it becomes equivalent to the other side, using angle sum or difference identities in particular.